Most of its medieval walls, both inside and out, are now obscured by the less attractive additions of subsequent times, but the Pisan Tower of the Normans' Royal Palace looks much as it did nine centuries ago, at least from the outside. Don't judge it from outside, for if its exterior is less than impressive, the Palace's interior still evokes much of its former grandeur. Its arched windows are similar to those of the Norman-Arab churches of Palermo, and the mosaics of some of the Palace's chambers are unabashedly redolent of those found in many of the same churches. A few majestic corridors crowned by vaulted ceilings are the Royal Palace's silent testaments to another era, when the Normans' polyglot Kingdom of Sicily was the most prosperous country in Europe. The Kingdom of Sicily was indeed a crowning achievement but, as we've said, much of the Royal Palace has been modified beyond recognition. Built on high ground on the site of earlier Phoenician, Roman and Saracen structures, the Royal Palace now houses the Sicilian Regional Assembly, the parliament of Italy's largest semi-autonomous "regional" government. Roger II ordered the palace's construction sometime before 1132. The Palatine Chapel and Roger's Room (the throne room) are the most evocative of the Kingdom's splendor. Roger's Room is usually closed to the public, but the Palatine Chapel is open during traditional hours. 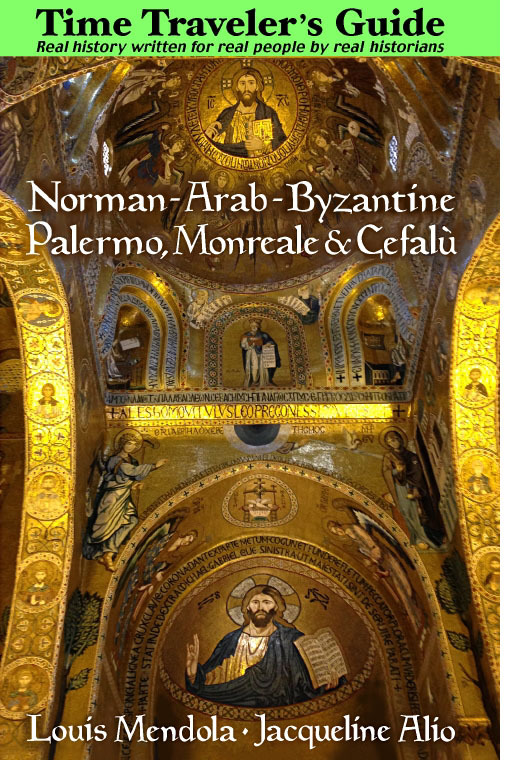 Resplendent with traditional Orthodox iconography and a painted Arabic ceiling, the Palatine Chapel seems to be a Monreale Cathedral in miniature, though it antedates that church by decades. Of note are the fine icons of Saint Peter and Saint James, and the throne. The lions on the wall above the throne resemble those used in the coat of arms of England's Norman kings some decades later, suggesting that the symbol originated in Sicily or one of the other Norman dominions. 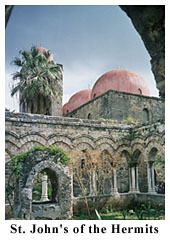 Relations between the English and Sicilian kingdoms were close; Otto of Bayeaux, brother of William the Conqueror, is buried in Palermo Cathedral. Roger's Room presents the visitor with mosaics of a "secular" nature, featuring representations of trees and beasts, including many found in Sicily. The palace was the seat of Sicilian administration throughout much of the twelfth century, and Roger is believed to have kept a harem here. Unfortunately, most of the Royal Palace's original corridors and rooms have been destroyed. From outside the visitors' entrance, a few of the pointed battlements have been preserved, and a number of knights certainly manned these defenses as part of the Royal Body Guard, but the Palace was not built so much as a fortified dwelling (i.e. a castle) as a palatial residence. The Royal Palace is open weekdays and Saturdays during the mornings and most afternoons. Read more about the Norman Palace. Located at the intersection of Corso Vittorio Emanuele and Via Maqueda, the "Quattro Canti" (Four Corners) is the traditional center of Palermo, the crossroad marking the heart of Palermo's old historic district. Many of Palermo's monuments, artistic churches and other sights of historical and visitor interest are located within walking distance of the Quattro Canti. Although almost everyone in Palermo calls the Four Corners "Quattro Canti", the intersection's official name is actually "Piazza Vigilena," named for the Spanish Viceroy who had the sculptures built on the Four Corners back in 1611. Each of the four buildings that comprise the Quattro Canti, has three levels covered with Baroque sculptures that were designed by the architect Giulio Lasso. The sculptures on the facades of the four buildings illustrate various themes: the Four Seasons, Spanish kings and various patron saints of Palermo's four old quarters. The fountains at ground level are typically Baroque. These sculptures were actually executed by a collective of talented local sculptors of that era, among whom d'Aprile, La Mattina and Tedeschi. Thanks to years of exposure to smog and soot, the once pearl colored sculptures have been transformed into a grimy gray that has obscured some of their definition but none of their magnificence. San Giuseppe dei Teatini is the large church located on the southeast corner of the Quattro Canti. It is the ultimate in Baroque. The church was designed by Giacomo Besio in 1612. The Dome was added in the 18th century. One of the more noted works of art in this Baroque jungle is "The Triumph of Sant' Andrea Avellino" painted in 1724 by the Dutch artist Borremans. Across Via Maqueda from the Church of Saint Joseph of the Theatines is Piazza Pretoria and its splendid fountain. Its sixteen statues are divided among the four sets of stairs leading to the largest fountain in the center; these statues are nudes of nymphs, humans, mermaids and satyrs. It is surprising that this fountain was permitted to be erected in Palermo during the heyday of the Spanish Inquisition. The fountain was originally commissioned for the Tuscan Villa of the Viceroy Don Pedro de Toledo, and created by the Florentine sculptor Francesco Camiliani in 1555. In 1574, the Viceroy's son , whose own artistic tastes were a bit more conservative, sold the fountain to the City of Palermo. It was shipped here piece by piece and was installed in front of the Municipio (City Hall), the large ochre building nearby. The tiny Church of San Cataldo, located near the Martorana, was built around 1154 by Maio (or Maione) of Bari, who was the "Emir" or Prime Minister of King William I "The Bad." Inwardly and outwardly, the church retains its twelfth-century ambience; it doesn't even have electric lighting. Externally, its most distinctive features are the three pinkish red domes or cupolas. Even if you've already seen Saint John of the Hermits, San Cataldo is impressive in its austerity. The Church, which is a religious seat of the knights of the Holy Sepulchre, is open only occasionally but worth a look if you have a chance. Down the steps at street level, at the base of its foundation, are the remains of a Roman wall. Saint Mary's of the Admiral is its official name. This church was built in 1143 at the behest of George of Antioch, who was a famous Admiral during the reign of King Roger II. George of Antioch was also responsible for the construction of the "Admiral's Bridge." Admiral George's official title was the Arabic "Amir-al-Bahr" or "Emir of the Sea." (Both the Italian "ammiraglio" and the English "admiral" are derived from this medieval Arabic title.) Arabic lettering is visible around the cupola. The church, which was Greek Orthodox during the Norman era, was "converted" to the Roman Rite in the 13th century. 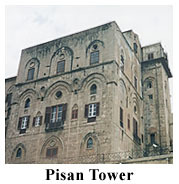 It became part of the Byzantine Catholic diocese of Piana degli Albanesi in 1935. The Martorana's original Norman Arab construction was unfortunately altered in the 17th century . The main nave and a good part of the mosaics were torn down and replaced with Baroque construction and frescoes. This changed the floorplan, which was initially square in conformity to most Orthodox churches of medieval times. The sections of the Church that still retain their original Arab-Norman characteristics possess some of the most beautiful mosaics ever executed in Sicily. Though the mosaic decorations here are not extensive, they are said to be the work of the best Byzantine craftsmen of that epoch, masters of the art specifically brought to Sicily from Constantinople by King Roger II to create the images in the Norman Palace and the Cathedral of Cefalù. The most famous mosaic in La Martorana is the one of King Roger II being crowned by Christ. It represents the sovereign's authority as emanating directly from God, not the Pope, an extremely important concept in the politics of 12th century Sicily. This design was later emulated in Monreale Cathedral, where King William II is portrayed crowned by Christ in a mosaic wall panel. Other noteworthy mosaics in the Martorana are that of Christ Pantocrator and that of Admiral George worshipping the Madonna. The splendid bell tower, representing the apex of Norman-Arab style, is the Church's outstanding external feature. The Martorana is open most weekdays from 9:30 to 1:00 and from 3:30 to 5:00, weekends from 9:30 to 1:00. 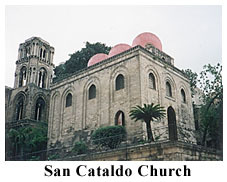 Th area around San Cataldo and the Martorana represented a multicultural zone of sorts, frequented particularly by the Greek Orthodox, the Roman Catholics and the Jews of Palermo, whose principal synagogue stood nearby. A few blocks away, the street market that is now Ballarò was the Arab souk. Located near the Royal Palace, the Abbey Church of St. John of the Hermits (San Giovanni degli Eremiti) is another fine example of 12th century Norman-Arab construction here in Palermo. That it was built upon a mosque may account for its particularly Arabic style, with five reddish cupolas. (Incidentally, we do not know for certain whether these cupolas were originally red.) The bell tower is the only part of the building that has a distinctively Norman appearance, with its Gothic lines and mullioned windows. Were it not for the bell tower, Saint John's could easily be mistaken for a mosque. The construction of St. John of the Hermit's was ordered by Roger II in 1130 for the Benedictine Order. St. John's visual impact results mostly from its external features, with its charming Arabesque domes amidst the surrounding trees and gardens, and an elegant cloister, probably a 13th century addition constructed in the Romanesque style, though it combines harmoniously with the Church and its surrounding gardens. The Church of St. John of the Hermits is open Mondays through Saturdays from 9 to 1 and 3 to 7. On Sundays, the Church is only open in the morning from 9 to 1. There is a nominal admission fee. The Basilica of San Francesco d' Assisi (St. Francis of Assisi) is a splendid medieval church erected in the typically Italian Romanesque Gothic style. Construction was begun in 1255 by the Franciscan Order, which still has a monastery here. The portal is noted for its richly decorated triple false arches, while the exquisite rose window above the main entrance is the epitomizes medieval Latin church architecture. The facade, built in the early 1300s by the Ventimiglia, Abbatelli and Chiaramonte families, is not unlike that of the Church of Sant' Agostino, but inside St. Francis retains a much more medieval flavor. The church has a nave with magnificent arches, and also a beautiful cloister. A side chapel is dedicated to the Sicilian branch of the Grimaldi family, better known in Genoa and Monaco. St. Francis of Assisi is open from 7:30 to 12:30 in the morning and from 4:30 to 6:30 in the afternoon most days. There are some charming restaurants and cafés in the piazza in front of the church. Visiting this unique church is to experience multicultural architectural diversity. Palermo's cathedral is known officially as "Santa Maria Assunta" or Saint Mary of the Assumption. Some scholars believe that a temple existed here in Roman, or possibly even Punic, times. There is no doubt that the site once had a large Byzantine Greek (Orthodox) church. Arab records mention the existence of a large "pagan" temple present on this site when they conquered Palermo in 831. This was turned into a mosque. In 1072, when the Normans wrested control of Palermo from the Saracens, Count Roger promptly saw to it that the Great Mosque was reconsecrated as a Christian church. The present cathedral was not completed for another century, and greatly modified through the ages. The church is a massive rectangular structure, with two towers at the two front corners constructed in the Norman Arab style. The exterior of the apse is similar to those of Monreale Cathedral and the smaller Basilica of the Magione. The Cathedral Treasury is a museum containing an assortment of finely crafted religious objects. There are illuminated manuscripts here and bejeweled chalices and crucifixes, along with sophisticated gold Jewelry adorned with Byzantine enamel ware. The treasury's most famous object is the Crown of Constance, a masterpiece of twelfth century metalwork combining Byzantine, Arabic and Western elements. 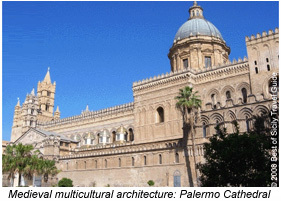 Read MUCH more about Palermo Cathedral. Despite its Phoenician and Roman heritage, Palermo is not an ideal place to look for ancient ruins; in this part of the province, Solunto and San Giuseppe Jato offer much more. Fragments of a Roman wall are visible at the base of San Cataldo Church near the Quattro Canti, and a few foundations may be seen in the tiny archeological park in Piazza Vittoria between the cathedral and the Royal Palace. Most of the beautiful mosaics discovered in Piazza Vittoria are on display in the local Archeological Museum, which is worth a visit. There are also Roman and Phoenician fragments beneath the Royal Palace. The absence of standing Roman structures in Palermo is to some extent a result of the city's medieval prosperity. During the Byzantine, Saracen and Norman periods new edifices were constantly being built in the city, often on the foundations of much older structures. Where are these structures? Walls in the Cassaro area along Corso Alberto Amedeo and Via Schioppetieri (the Santa Caterina Convent) are readily observable examples of Roman and Punic era construction. The "Chiesa del Gesù" (Church of Jesus), also known as Casa Professa is Baroque masterpiece located in Palermo's Alberghieria quarter near the Quattro Canti. The Jesuits built the original church here, the Order's first one in Palermo, between 1564 and 1578. Afterwards, the Church was enlarged with the addition of side chapels and further decorated in the Baroque manner. When it was finally completed in 1634, the Church was Palermo's most ornate Baroque church, and still is. Interestingly enough, a great part of the work here was done by Jesuit priests themselves and not by commissioned artists. The Baroque was the architectural embodiment of the Counter Reformation's ideals, its answer to the simplicity stressed in most Protestant places of worship. Its ornate stone inlay (intarsia) is the church's most distinguishing artistic feature. Casa Professa was damaged during World War II, but was superbly restored following that conflict. It is open most mornings from 7 until 10:30 and most afternoons from 5 to 6:30. 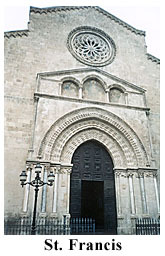 Nearby is the Ballarò street market and the medieval Church of San Nicolò. The market, and its very name, dates from Arab times. The Basilica of San Domenico (St. Dominick), off Via Roma, is another fine example of Sicilian Baroque and is also known for the many prominent Sicilians laid to rest in it. San Domenico's landmark is the obelisk-like "Colonna dell' Immacolata" in the piazza in front of the basilica. 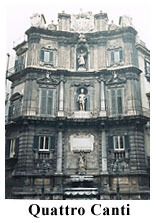 The church is noted for its facade, designed and built in 1726 by Tommaso Maria Napoli. The inside of the Church is not particularly interesting, except for the tombs of several Sicilians of national prominence. Francesco Crispi, the first prime minister of a united Italy, is buried here. The church is also the final resting place of folk scholar Giuseppe Pitré, and artist Pietro Novelli. The streets off the piazza will lead you into Vucciria, another one of Palermo's street markets with an oriental bazaar ambience. "Vucciria" is a corruption of the French for butcher-shop, "boucherie."